For certified document destruction we can send you heavy-duty rubble style sacks and cable/zip ties to seal the sack when full. We supply a pack of 10 for just £10. When you are ready simply email us and let us know how many sacks you have filled. You cannot put plastic in with the paper, so no poly-pockets, plastic sleeves, plastic dividers or plastic files. Paper clips and staples are ok.
To destroy the documents and provide you with a destruction certificate the charge is £10 per sack, and an optional single charge of £10 for the certificate regardless of the number of sacks we collect from you. 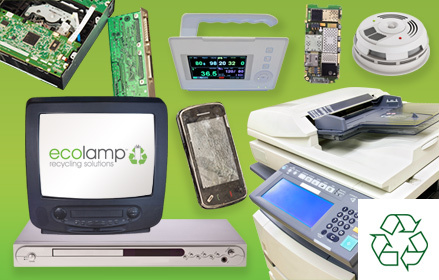 recycling, and they also collect paper documents from our clients for us in the same way. 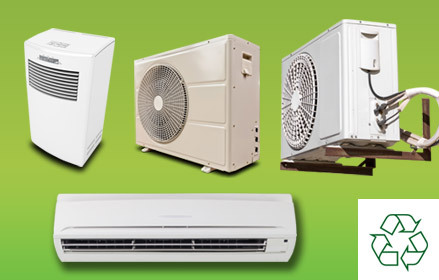 This allows us to quote you the same low price regardless of your location. If you prefer you can double bag and double zip-tie the heavy-duty document sacks for extra security against damage whilst in the care of TNT. This transport service costs £10 transport per sack of documents, so a total of £20 per sack including the destruction. 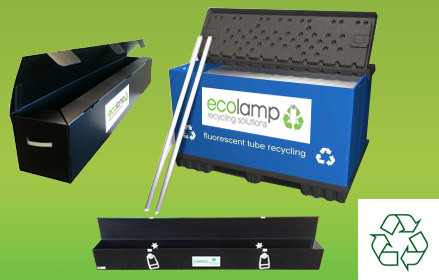 An Ecolamp Ltd employee will call at your premises in a vehicle owned by Ecolamp Ltd. 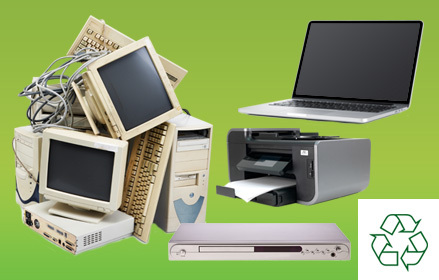 The documents are then taken directly to the shredding/destruction facility and are not handled by a third party at any time. 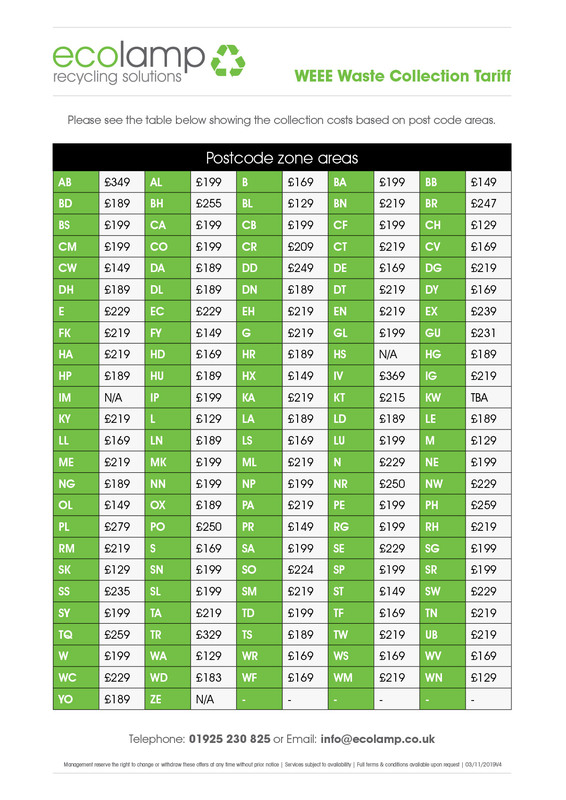 The table of costs below shows the transport cost to your area by postcode. Option 1 is more cost-effective, less secure. Option 2 is more expensive but more secure. Both methods are GDPR Compliant. 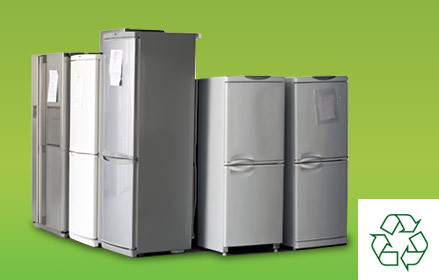 PLEASE NOTE: The transport cost in the table above for option 2 would not apply if we are already attending your site to collect waste fluorescent lamps, batteries, fridges, electrical or electronic/computer/IT waste. 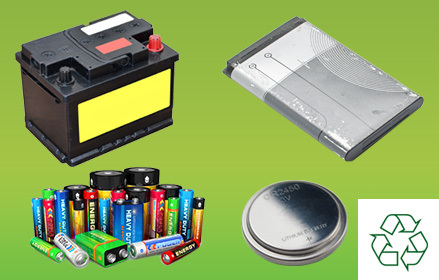 We would simply charge £10 per sack in addition to the charge for recycling other items. To order either of these two services simply send a Purchase Order for £10 per 10 sacks. A PDF document will appear in a new browser website window. 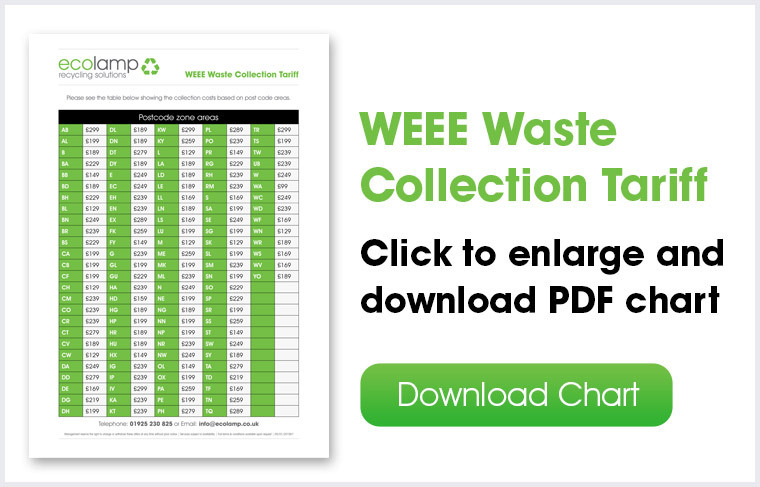 However, if you are unable to see the WEEE Waste Collection Tariff Chart please check your documents and download folders for the file.